"But now it looks as if President Jacques Chirac of France, who leaves office on May 16, may be about to lose the last battle of his 12-year presidential career," writes Patrick Seale. Ban Ki-moon, the head of the UN, shocked an expectant March 14 crowd when he delayed decision on the tribunal until the end of May, when the present session of the Lebanese Parliament (which isn't meeting) is scheduled to end. Anti-Syrian Prime Minister Fuad Saniora and 70 of parliament's 128 members have urged the UN Security Council to establish the tribunal. But Ban said he was not prepared to recommend council action now, and he refused to say how long he would wait. Lebanon's opposition has threatened that the country would be destabilized if a court is established under chapter 7 by the Security Council. The March 14 coalition had pulled out all the stops to get a quick resolution establishing the tribunal, insisting that if there was to be action on the court, it had to be done before President Chirac left office in mid-May. Chirac was personally devoted to Rafiq al-Hariri and will be taking up residence in a Hariri owned apartment in Paris, upon leaving office. No one knows whether Sarkozy will choose to follow Chirac's anti-Syria policy, or whether he will decide that the Bush policy of confronting and destabilizing Syria is kaput, much as the Democratic Party in the US has. The silence coming out of Lebanon following Ban's delay is deafening. Not a peep has emerged from the March 14th crowd, who had previously been trumpeting the tribunal as an "existential" need. Why the silence? Shock, perhaps, but a more likely reason is that the Lebanese government is still hoping that Sarkozy will take up their cause. They are keeping their powder dry for a second push. For the last week in Lebanon, all eyes have been riveted on the revenge murder of two Sunni boys who were found near Sidon. The boys were linked to Junblat's party. Their killings have been blamed on the four brothers of Adnan Shamas, a Shiite, who was killed in the January 25 riots by Junblat supporters. Junblat has called for calm, and all Lebanon has been on tenterhooks, fearing that the incident could plung the country back into civil war. The opposition has threatened that if the tribunal is voted into existence by the Security Council, it will destabilize Lebanon. The March 14th crowd cannot allow an escalation of violence or animate international fears that Lebanon is perched at the edge of a precipice and ready to plunge back into civil strife. The US administration has been silent as well, neither admitting the defeat of its Lebanon-Syria policy nor promising success in a month's time. Even Syria has been silent, cautious about claiming premature victory. President Assad has been solicitous of Ban, promising him that Syria will enhance border controls to stop weapon smuggling to Hizbullah. The Lebanese and Syrian governments have agreed to reactivate a committee that meets on border issues at a higher level. Syria has also been agreeable on the Iraq border issue in an effort to defuse US tensions and deny the neocons their favorite chant — "Syria is running a Ho Chi Min trail to the jihadists in Iraq." "There is some possibility that Syria may have taken some actions to make it tougher for these foreign fighters to move through,'' said Gen. David Petraeus. Syrians will go to Cairo to talk with Iraqis. Foreign Minister Mualem said he would be happy to talk to Rice, if she would talk to him. If Washington must begrudgingly cease complaining about Syria's behavior on the Iraq border, it can find many other Syrian faults to deplore. Syria just held its parliamentary elections, which are of largely symbolic significance. Increased press freedoms in Syria and the spread of the Internet served to highlight the way in which the Baath Party controlled the election process. Several privately owned Syrian news sources – Syria News, Cham Press, and All4Syria have printed scads of critical articles by a wide variety of Syrians. Ayman Abdalnour, the editor of all4syria has described the important coverage of the elections his newsletter was able to carry in this article in English. Syria's sentencing of Anwar al-Bunni, one of the country's leading human rights lawyers, to five years in prison, has been widely condemned by international agencies, the State Department, and Syrian activists. A letter written by Syria's leading political prisoners is posted on the Damascus Spring blog. The sensitivity of the Tribunal issue at the UN is so high that the UN Undersecretary General for Legal Affairs Nicolas Michel, who has recently returned from Beirut, was only allowed to present an "oral" report to UN chief on the international tribunal. Presumably, Ban Ki-moon does not want a written report that might be leaked or passed around. Lebanon remains paralyzed as government and opposition forces refuse to discuss any government bills until the tribunal question is resolved. Syria is playing it cool and insisting that the issue is none of its concern and something that must be resolved by Lebanese alone. Meanwhile, the Levant states will be holding their breath for another month, to see how France's new president decides to position him or herself self in the Middle East labyrinth. Much can happen in a month. Should the Bush agenda continue to lose steam, there is little chance that even Sarkozy, should he be elected, will want to begin his presidency by placing his money on the March 14th government in Lebanon. Nor will he want to make the possibility of reopening dialogue with Syria more complicated, which the establishment of an international tribunal would certainly do. He has said that "Lebanon is important, but is not everything." Such ambiguous statements give him plenty of latitude. Seale writes that a number of Security Council members, "notably Qatar, China and Russia, have indicated their reluctance" to establishing a tribunal under chapter seven. But as the world begins to think better of President Bush's policy of using force to solve Middle East problems, the three dissenting members of the Security Council are not the only states reluctant to endorse the tribunal. Lebanon is splintering and in no condition to be used as a battering ram to force change on the region. Turkey, for instance, has rarely found itself at such cross-purposes with America since joining NATO in 1952. Over Iraq it finds itself more in tune with Iran and Syria, due to worries about its own large, restive Kurdish minority. Egypt and Jordan have close military ties to America too, but their governments must constantly parry sniping from such populist, exuberantly anti-American opponents as the Muslim Brotherhood." It concludes, "the State Department under Condoleezza Rice may be adopting less abrasive policies in the region. “They've come to realise that the multilateral approach can be more effective,” says an Arab ambassador…. America still chastises Syria, accusing it of meddling in Iraq and Lebanon. But Syria's relations with European as well as Arab countries, including Iraq, are thawing. It is probably a matter of time before Syria, Iran's closest regional friend, comes back from isolation." Working in tacit cooperation, the United States, Saudi Arabia and Israel would roll back Iran's regional influence by taking down the extremist Hamas Palestinian government in Gaza, containing Hezbollah's bid to control Lebanon and destabilizing Iran's main regional ally, Syria. The Saudi King has a very different plan. Indyk writes: "His opening price is Bush's accommodation of Hamas and Syria as players in the peace process, and he'll settle in the end for Israel's withdrawal from the Golan Heights and the West Bank." Given the broad regional shift away from the Bush agenda of confrontation, it is little wonder that Ban Ki-moon decided to punt on the International Tribunal. For the same reason it is unlikely that Sarkozy will try to revive it during his first days in office. He will be planning a fresh approach to the Middle East. I do not think that the UN will back down from the tribunal. After several UN security resolutions & a lot of $ Millions spent so far on the investigation and then forget about it? Why and for whom? They will ALL (Bush, Chirac, UN, M14, & international community) loose credibility. It is way too much of a price to pay to save Bashar & the Syrian Regime. He is definitely not worth it. Another factor that I am hearing about is the negotiations by the Saudis regarding change of status to a non-Chapter 7 probe, which would take much heat off of Bashar Assad. This is in line with the Saudi-Iranian talks in Riyad a month or so back, regarding a compromise deal on Lebanon, giving more of a share of power to Hezbollah, etc. All that seemed to hang on concessions to Damascus regarding the Hariri matter. The Saudis were negotiating with the Belgian judge and others regarding how to "modify" the Hariri tribunal resolution, so it would be less threatening to Syria, and likely get support from Hezbollah ministers with Damascus' OK. Does this conform with things you are picking up? Chairman of the Hague Tribunal: "An international Hariri tribunal, and hence under Chapter VII, cannot be in cards"
"C’est en tout cas ce qui ressort de la position exprimée récemment par le président du Tribunal pénal international spécial pour la Yougoslavie,Fausto Pokar, qui estime que « le Conseil de sécurité ne peut adopter le statut d’un tribunal dit mixte sous le chapitre VII de la Charte des Nations unies car le tribunal spécial pour le Liban (…) devra fonctionner selon les lois libanaises pour juger les auteurs des crimes commis localement et qui sont à caractère non international … Par conséquent, soutient l’expert, on ne saurait créer un tribunal mixte sans l’approbation de l’État concerné. Et quand bien même le Conseil de sécurité opterait pour le chapitre VII, l’État libanais devrait en ratifier le statut et la convention bilatérale, selon les procédures constitutionnelles en vigueur. Ce qui, si l’on en croit cette analyse, nous ramènerait, à la case départ, les institutions étant, à ce jour, paralysées." On her plane en route to Egypt the secretary said she "wouldn't rule it out." 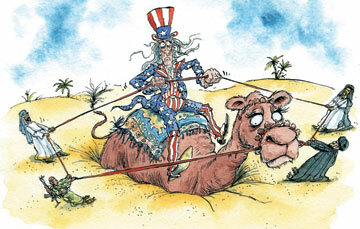 Rice also said she felt Syria had an ultimate interest in helping a stable government emerge in Baghdad. Rice and Moualem will be in the Egyptian Red Sea resort of Sharm el-Sheikh for two days of meetings of Iraq's neighbors and U.N. Security Council permanent members. A meeting between Rice and Moualem would mark a shift for the Bush administration. It is unclear how extensive an agenda Rice and Moualem would pursue. Mr. Sarkozy is unabashedly pro-Israel. He stunned Arab ambassadors in Paris recently, opening his remarks by saying that his foreign policy priority as president would be to forge a closer relationship with Israel. He also has said in private that French policy has not been tough enough against Hezbollah, which he, unlike Mr. Chirac, brands a terrorist organization. Dr. Landis; thanks a bunch for the insight on the tribunal, although it’s still not clear to me whether the disagreement is about the terms of the tribunal or the establishment of the tribunal itself? Are you giving us our Golan heights back before the 40th anniversary of its occupation? Very good summarization! The international tribunal idea was absurd in the first place. Syria and Israel and Saudi Arabia or other suspected countries will never accept to put on trial any of their citizens, if indicted, in front of lebanese judges!!! A criminal investigation with the help of the UN, yes, but an international tribunal is supposed to judge crimes against humanity, not the killers of a rich businessman and other political personnalities. (the lebanese have had their share of vendetta and killings of political personalities during the civil war). Lebanon is ruled by mafiosos making use of any rogue allies they can find to get more power and enrich themselves. Lebanon needs an anti corruption tribunal but this is more like a wishful thinking. I think the international tribunal will die off.. Ban Ki Moon, Sarkozy or Segolene have other priorities and they don’t need a flat in Paris yet. Instead of reciting cliches and jargons against Syria, its people, and the author of the analysis above, how about giving us an alternative discussion of the above. What is the rationale behind your $100 bet? Most of us would appreciate a serious and rational response to the above events. Can you provide us a link to your institute? What type of work is done there? “Accommodation of Hamas”? What a novel thought! As for me, I’ve always wondered how such educated people can ignore reality is such large quantity. Is “Ignoring Reality” a required course in for International Relations majors? This Eli above is a fake. Shavat institute ? It’s where???? on Mars ? Iraqi Defense Minister Abdul Qadir Al-Obeidi has accused Syria of standing behind the terrorists and supporting them. There have been occasional clashes between Syrian and Iraqi forces to ensure the entrance of the terrorists into Iraqi territory. The minister has also announced that his forces have seized a number of car bombs coming from Syria. Don’t miss the addendum at the end of this post. It’s funny to see you trying to clean up your horsecrap. Earlier I saw that you wrote that Sarkozy would not put his money on the “march 14 crowd” (it’s nice to see you use the regime’s lingo too, very adorable). Because you see, Sarko will most definitely put his money on Hezbollah! Riiiiiiight… Then after the addendum with the NYT quote about Sarko and Hezbollah, miraculously, that ridiculous line gets “edited out”! Nice job! Now if only you could do that with the entire stupid post. Sorry to disappoint you G. but I haven’t edited anything from the article. You are going blind. No one knows what Sarkozy will do. I am afraid it is wait-and-see for now. NO one knows but you apparently! Cause you have it all figured out about where he’ll put “his money”! Such idiocy. G. You are in a bad mood. Read this by Michael Young, who argues that the court will be established. It should cheer you up. It is in Lebanon that Syria has shown the least inclination to concede anything. That’s why the U.S. must use any future conversation with Iran, assuming it goes well, as leverage to consolidate Lebanon’s fragile independence…. Up to now the Syrians have successfully pushed their allies in Beirut to block creation of the tribunal through a Lebanese constitutional process. U.N. officials and the five permanent members of the Security Council have indicated that if this continues, the tribunal will be set up under Chapter VII of the U.N. Charter. Even Russia has said it would not veto this…. The Lebanese government and parliamentary majority, which oppose a Syrian return, are wary the U.S. might sell them out on Syria’s and Iran’s behalf. That’s a possibility, but a more likely outcome, given the broad Arab and international opposition to Syrian meddling in Lebanese affairs, is that it is Mr. Assad who will have to bend. I’m sure nothing as gleeful as your cheering for murderers to get away with murders. Shameful. He’s also accommodated Young’s article, which seems to be the opposite side of the argument. Oh please. the entire post is dripping with glee. typical of landis. you must think all readers are idiots. UNITED NATIONS, May 2 (Reuters) – The U.N. Security Council faced a divisive debate over setting up a court in the murder of Lebanon’s former prime minister after a U.N. envoy reported on Wednesday he had failed to break the deadlock in Beirut. Major Western powers believe Lebanon’s feuding politicians are unlikely to agree any time soon to formally endorse the tribunal and that U.N. action is needed, but some other council members, including Russia, disagree, diplomats said. The world body had hoped Lebanon would agree on a law establishing the court after it asked the council to approve the tribunal and investigate the killing of Rafik al-Hariri and 22 others in a bombing in Beirut on Feb. 14, 2005. But the issue is deeply enmeshed with Lebanese politics. Nabih Berri, the opposition speaker of parliament, has refused to call a session of the chamber to ratify the tribunal. U.N. Secretary-General Ban Ki-moon sent special legal counsel Nicolas Michel to Beirut last month to seek a way out of the impasse, but without success. “I had to say (to the Security Council) that I had no progress to report on the efforts that I made,” Michel told a news conference after briefing the council on his trip. Opposition politicians had said they would not discuss the tribunal until Lebanon’s government was reconstituted to give them the blocking minority they have so far lacked, he said. Central to the dispute is Lebanon’s relationship with neighboring Syria, which some Lebanese officials blame for the Hariri killing. Most opposition leaders are close to Damascus, which denies any role in the bombing. The council “could assist the Lebanese by establishing the tribunal, that the Lebanese have agreed to broadly, under Chapter 7,” he added. Chapter 7 of the U.N. Charter makes a council decision mandatory. Western diplomats said the United States, France and Britain favored prompt U.N. action to set up the court. “We think that the time for the Security Council to exercise its responsibilities is approaching,” said Ambassador Jean-Marc de la Sabliere of France, which has close ties with Lebanon. But diplomats said it was unclear how the process would be started. Ban could prompt a resolution from Beirut’s allies the United States and France, but a fresh approach from Lebanese politicians might be needed first, they said. Some council members oppose the use of Chapter 7 to impose a tribunal, a move the Lebanese opposition group Hezbollah has said could plunge the country back into strife. (c) 2007. The Associated Press. All Rights Reserved. SHARM EL-SHEIKH, Egypt (AP) – The U.S. and Syria could hold their first substantive high-level talks in years as early as Thursday, energizing an international gathering on Iraq’s future. Syria has been eager to rekindle relations with a standoffish United States. There were signs Wednesday that Secretary of State Condoleezza Rice was warmer to that idea than to what would be a more dramatic face-to-face meeting with longtime adversary Iran. Rice said she’s willing to talk with Iran, too, after years of accusations and name-calling between the nations. President Mahmoud Ahmadinejad expressed interest, too. “If we encounter each other, then I’m certainly planning to be polite, to see what that encounter brings,” Rice said of a potential discussion with Iran’s foreign minister. Ahmadinejad on Wednesday said Tehran would welcome talks with the U.S. on the sidelines of the conference, the official Islamic Republic News Agency reported. “The Iranian nation welcomes honest dialogue” with the U.S.,Ahmadinejad was quoted as saying during a speech in the southern Iranian city of Sirjan. Ahmadinejad also warned that it would be a mistake to think the U.S. could pressure Iran into rolling back its nuclear program with dialogue. The Bush administration has accused both regional heavyweight Iran and the less influential Syria of sowing terrorism in the Middle East and undermining the fragile U.S.-backed government in Iraq. The U.S. put both nations in diplomatic deep freeze in recent years, and until recently Rice dismissed the notion of talking to them as a fool’s errand. The bipartisan Iraq Study Group, U.S. allies and lawmakers of both parties have urged President Bush to reconsider in the hope that Iran and Syria can be persuaded to use their influence inside Iraq. The two-day conference in this Red Sea resort town is expected to bring together officials from Iraq, the U.S., Iran, Russia, China, Europe and Arab nations. Although the subject at hand is the economic and political stability of chaotic Iraq, even the conference host Egypt appeared focused on the possibility for tentative diplomatic openings around the edges of the formal sessions. Rice could meet as early as Thursday with her Syrian counterpart, Walid Moallem, said an Egyptian official, who spoke on condition of anonymity because he was not authorized to speak to the media. Separately, Iraqi Foreign Minister Hoshyar Zebari did not rule out the possibility that Rice could also meet with Iranian officials here. “There will be an Iranian-American or Syrian-American meetings, and all the parties have expressed their enthusiasm for these meetings,” Zebari told reporters. He did not elaborate. “It’s a possibility, an open possibility,” Rice’s spokesman, Sean McCormack, said of talks with the Syrians. Rice met Wednesday with embattled Iraqi Prime Minister Nouri al-Maliki, whose own ties to Iran have sometimes made his U.S. backers nervous. Al-Maliki advisers said he told Rice that Iraq suffers from being caught in the middle of competing international interests. If Rice meets with Moallem, it would be the first such high-level talks since the February 2005 assassination of former Lebanese Prime Minister Rafik Hariri. Syria denies it had anything to do with the killing, but U.S. and European officials have since shunned the Damascus government. No U.S. officials would outline specific plans for sessions with Syria or Iran, but any contact would probably not be as casual as Rice suggested. All sides have been gauging signals from the others, and even a brief encounter would probably come only after careful behind-the-scenes orchestration. That is especially true for any contact with Iran. In London, Rice’s top deputy in charge of the troubled Iran relationship sounded optimistic. The United States and Iran have not had any meaningful contact in a generation, even though the country has a central role in crises confronting America in the Middle East, U.S. Undersecretary of State Nicholas Burns said in comments delivered at the British think-tank, Chatham House. He said he hoped Rice would be able to speak directly to her Iranian counterpart this week. WASHINGTON (AP) – Faced with the biggest military buildup by Syria along its border since the 1973 Middle East war, Israel is privately reassuring its Arab neighbor that it does not seek a confrontation, Israeli Ambassador Sallai Meridor said Wednesday. “We use every effort to send messages to Syria we have no offensive intention,” Meridor said. Mostly steering clear of the political turmoil at home, which he said was not appropriate for him to discuss publicly, Meridor nonetheless said Israel would continue “to do everything humanly possible to enhance peace” opportunities with the Palestinians. “We are trying to create opportunities for the Palestinians to make peace,” he said. Offering to evacuate thousands of Jewish settlers on the West Bank and make other concessions, Meridor said: “I do not know a country in the world which would risk as much” for peace. “We are not going to give up the slightest opportunity to move forward,” Meridor said at a luncheon sponsored by The Israel Project, a private group. However, he gave no indication Israel would alter its policy of not dealing with Hamas, which plays a dominant role in the Palestinian government and is considered a terror group by the United States and Israel. At home, Israel’s foreign minister, Tzipi Livni, called on Prime Minister Ehud Olmert to step down and said she would seek to replace him after a harsh report criticizing his handling of the war last summer with Hezbollah militia in Lebanon. Meridor said he had not briefed Bush administration officials or had any meetings with them about the political situation. And he declined to discuss it. Meridor said Russia was contributing to Syria’s arsenal by providing the country with missiles. Syria lost the strategic Golan Heights to Israel in the 1967 Mideast war and failed to recover the territory in a war in 1973 in which Egypt and Syria fought against Israel again. Israel annexed the territory in 1981 and about 8,000 Israelis live there. U.S.-assisted negotiations with Israel and Syria have failed to resolve the dispute on a land-for-peace basis. The most recent peace conference broke down in 2000. For defenders of the Syrian regime, enjoy the savage and barbaric torture robots in the Syrian mukhabarat. After watching the debate between him and Royal yesterday, I believe that it’s not going to be an easy ride for Sarkozi. Nothing. Not a single word about Lebanon. The funny thing is that they both acted very different .. she was decisive and assertive, he was sweet and polite … bth listening to their campaign managers I guess. I think Royal was very charming and a7em, attractive too. وتشكل نهاية ولاية شيراك خسارة للشرق الأوسط ولبنان والعراق وكل القضايا الساخنة الاخرى، لأن من سيخلفه سواء من حزبه، أي وزير الداخلية نيكولا ساركوزي، أو النائبة الاشتراكية سيغولين رويال، ليس لديهما ما يكفي من خبرة للتعامل مع هذه المنطقة. وساركوزي، الذي يحظى حالياً بإعلى نسبة من التأييد الشعبي، أدرك أن 75 في المئة من الفرنسيين تؤيد شيراك في سياسته الدولية، ولذا فإنه في خطابه حول السياسة الخارجية، أيد ديبلوماسية شيراك ومبادئه، بعد أن كان يخوض حملته على أساس شعار القطيعة، واختار استمرار العمل بمبادئ شيراك الدولية مشيداً بها. أما رويال فكانت أكدت عزمها على الحفاظ على استمرارية السياسة الخارجية منذ أول إعلان لها في هذا المجال. وهناك من يترقب مغادرة شيراك للرئاسة، ويعتقد هؤلاء بدافع من ديبلوماسيتهم «الماهرة» و «الناجحة» أن سياسة فرنسا ستتغير، بعد رئيسها الحالي الذي وصفه نائب الرئيس السوري فاروق الشرع بـ «القبلي»، وقال لصحيفة «لوموند» أن سورية لن ترسل سفيراً جديداً إلى فرنسا قبل بدء العهد الرئاسي الجديد. وهكذا ينتظر نائب الرئيس السوري، الخبير في طريقة عمل الانظمة الديموقراطية، التغيير الرئاسي في فرنسا لإعادة السفير السوري إليها، لأنه يعتقد أن وجود هذا السفير هو هدية من سورية وليس حاجة للديبلوماسية السورية «الناجحة». في كل الأحوال، «نجحت» الديبلوماسية السورية خلال سنوات قليلة في فقدان سورية صداقات ليس فقط في فرنسا، بل أيضاً في أوروبا، كما تمكنت من افشال «اتفاق الشراكة الأوروبي – السوري». ويراهن الشرع على تغيير فرنسا لسياستها، لكنه ينسى أن ديبلوماسيته هي التي أدت الى تدهور العلاقات بين البلدين. والأفضل أن يتوقع مهندس الديبلوماسية السورية أن تستمر السياسة الفرنسية الخارجية من دون تغيير لأنها تستند الى قرارات الأسرة الدولية التي سبق أن أيدتها الدول الأوروبية وفي طليعتها فرنسا وشعبها. Yes Alex, she was charming! I noted that too! I can’t believe she’s in her 50s. That’s true DJ, I did not think of it this way. He had to remain polite with her. Maybe we can expect the same when they debate Senator Clinton next year. “Shamata” is not an honorable feeling usualy, but in the case of most people on this site, espacialy the owner of the blog, we in Lebanon hope that the tribunal will come and make you swallow your perverse words. For most of you, obviously living comfortably in the US or somewhere in the West, not in Iran, not in Syria, but being “patriotic”, “arabists”…at our expense. It doesn’t cost you anything. For us, it’s costing us one precious life after the other, our health, our hopes for the future.. So yes in your case, “shamata” will be sweet and we hope that the tribunal will come and break the back of that poisonous regimne you keep defending against all logic. Dr. Landis – interesting reading here, as usual. In light of the thrust of the end of this selection, I thought I’d point out that Rice actually is meeting with the Syrian foreign minister during the regional conference today. Foxnews picked it up; I’m sure other sources have as well (I haven’t time to run down the original report, unfortunately). See you in class. I would think it’s by now out of the March 14 coalition and other Lebanese group’s authority to determine if the Hariri Tribunal process Go or No go. In less then perfect diplomatic world, we need to assume that the Security Council has the upper hand on this matter which has been used to maintain security and advanced some of the priorities set by the console core members. I would argue with anyone the fact It’s also naive to discount the impact of the first Mehlis report delivered to United Nations Secretary General Kofi Anan on Oct. 20, 2005. His report found that top Syrian and Lebanese officials were involved in the detailed plans for Hariri’s assassination.. The report stressed the fact of a complex plot that could not have been taken without the approval of top-ranked Syrian security officials and could not have been further organized without the collusion of their counterparts in the Lebanese security forces. !! Is telling us that the regime in Damascus has enough confidence in it’s hands to maneuver around this pressing Hariri Tribunal issue, even it started to let one of it’s winning core cards “the Iraqi card” slip away. I would have to agree that it’s too late to question Assad’s legitimacy and his grip on power since No members of Assad’s regime has been directly implicated after two years of proficient and almost completed works by the investigators. Condoleeza Rice met with Mouallem today at sharm El-Shaikh. I always thought that the threat of a tribunal was much more important than an actual tribunal. Many players in the axis of the US want a weakened Syrian regime not a change of regime. They all want to deal with the devil they know rather than the one they may get by replacing the regime. Only Chirac wanted a vendetta with the Syrian regime and it is too late for him now. The problem is that the demands placed on the Syrians were totally unrealistic. The protagonists wanted the Syrian regime to participate in its own demise. They the regime to commit suicide and abandon its cards HA and Hamas as well as its relation with Iran. As for the Lebanese March 14th group, they are silent waiting to see where the wind blows. Watch for what Jumblatt says, as he has a very good nose for sniffing the wind. Someone should remind the French that when it comes to Middle East politics, they are irrelevant; unless they are on the US side. Observer, I agree with you. The tribunal is about the process and not the outcome. If we put the sequence of events since the invasion of Iraq on a piece of paper and relate that sequence to the overall scheme of rearranging the landscape of Middle East based on the neoconservative ideas, interesting results start to emerge – showing that the Hariri murder fits nicely into that scheme. However, planning a scheme is one thing and achieving the desired outcome is another. The grave incompetence and arrogance of managing the war in Iraq, the failed efforts to destabilize Syria post Hariri murder, the reckless and deadly adventure of Israel into Lebanon, and the US November elections did cause a back-to-the-drawing-board re-thinking. What we are seeing today is a last-ditch effort from the US administration to accomplish anything they can claim as a “win”. Otherwise, the Republicans are going to be doomed for a long time. As a newbie to this issue what role does is the UK playing in all of this. While they don’t advertise it too loudly they do have interesting connections to the top in Syria. In fact I would not doubt that secretly one of France’s and Chirac’s grudges against Bashar and co. is that he looks more to the UK than Syria’s and his father’s historical patron France. My hunch is that some in the UK government dislike Chirac so much that they view anyone connected to him i.e. Hariri to be shady and corrupt especially opposed to British born you know who. Rami. How many of you “valiant” young’uns has Lebanon lost on the sidewalks of Gemayzeh, or the dungeons of Rue Monot? Stop blaming the Syrians for all that ails you, and look at your sectarian killer of a system. Until you do, you and your ilke will remain pawns of the bigger players with bigger sticks and bigger stakes! The big ones don’t give a rat’s arse about you, your warped “democracy”, or your expedient “martyrs”. Go read your history with its century old vendettas (Druze vs. Christians … yes.. yes they still hold water)and try to rehaul your decaying system. Only then, will you be taken seriousely. Only then. That is america’s only way to win in Iraq. Your recurrent “arguments” mixing up our night life, sectarian problems, political shortcomings…is a cheap shot always used to give you good conscience in supporting that murdurous regime and avoiding the real issue. We are not blaming Syria for all our problems and we don’t need you to point out what’s wrong with our system, your brillant insight would be of better use on your own backyard. We are blaming Syria for what it did and for the fact that there is no way to start “rehauling our decaying system”, as you say, without taking the necessary steps to get Syria out completely and start healthy normal relations with it, instead of the patronising chauvinistic big brother attitude. You defend the regime in that because basicaly this attitude is shared by a lot of people in Syria unfortunatly and you just don’t want to question it. We certainly don’t need lessons in history from you to know that we are not saints, that a lot of our leaders are questionable characters, that our history is bloody. But on planet earth, very few people are saints, have ideal leaders and not a drop of blood in their history. This self-rightous purist attitude is basicaly a totalitarian pretext to continue denying the political requests of the other side. We don’t need a certificat of “purity” and “merit” (in your eyes) to claim what we see as our right to justice, to real independance from Syria. What we do with that independance afterwards is our business not yours. As for the “big ones not giving a rate’s..” about us, there you may be right, and that would be unfortunate for us, but that would not make us feel any different about how we think relations should be between two countries.Meaning that wheather we win or loose won’t make us endorse your attitude and your arguments,and it won’t make them right. You didn’t sound very Lebanese in your first message, but that’s beside the point, we have thousands of Lebanese squating the downtown. It’s about the whole attitude towards Lebanon. The issue starting this argument was about the international tribunal, when you position yourself against it you’re defending those who are trying to stop it and that’s the syrian regime, so you’re defending the syrian regime in my eyes in that respect. Wheather you are or are not a “regime defender” doesn’t matter, what matters is that you’re taking a position to their advantage. That’s your choice, call yourself wahtever you want but don’t expect me or others to like or approve it. You didn’t respond to anything I said, you just backfire, that’s what’s not becoming. The hypothetical international tribunal may not be the best solution to deal with Lebanon’s accumulation of unpunished crimes since its independance. It will cost millions to Lebanon, will last many years, will be used by foreign countries as the regional crisis with Israel and Iran persists and may not reach satisfactory results. In addition if it is under chapter 7 it will allow the foreign powers to call for sanctions and boycott countries that do not submit suspected citizens to the tribunal. Imagine the tribunal calling for sanctions against Iran or Israel!!! If the tribunal is only aimed at isolating and crushing Syria, the investigation report of Mehlis was an attempt( a rehearsal) to do that and it failed miserably as Syria is now coming out of its isolation to solve much more crucial issues for the US: Irak. Lebanon was not even mentionned in Sharm El Sheikh: the international community is annoyed and embarassed to have to clean Lebanon’s dirty laundry and may soon loose interests and find another solution to relieve themselves from that burden. Unfortunately, the outcries of the lebanese government seems to echo in an emptying room and for the first time they have to manage on their own to find a political solution to their country, as this is the only thing that will prevent further crimes. they have done that with Taef with the results we know: as long as the syrians were ruling the country, it was implemented and when the lebanese were freed from the dictatorship of the syrians, Taef went down the drain together with the constitution. The only positive outcome was a strong and united army lebanese are proud of (thanks to Lahoud and the syrians). A united and strong country is the best garantee. Hezbollah has proven that Lebanon can be a militarily strong country, now let see how Lebanon can be politically strong. The international tribunal is a step in the wrong direction and will only bring more problems.